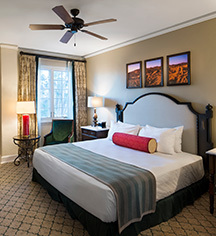 The historic Inn at Death Valley features 66 elegant guestrooms. This jewel of Death Valley pampers each guest and provides a space in which to relax and rejuvenate. The accommodations offer stunning views of the Oasis Garden, Panamint Mountains, or the desert vistas. Each classically beautiful room has amenities like flat panel televisions with satellite service, a coffee and tea maker, modern baths, complimentary toiletries, ceiling fans, and refrigerators. Accessible, ADA compliant rooms are available. Standard King Rooms – Offers stunning views of various locations and a king-size bed. 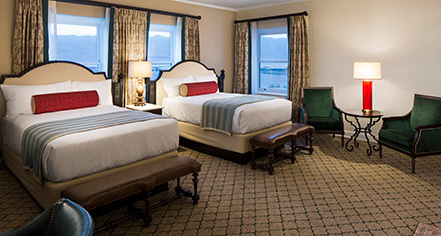 Deluxe King Rooms – These rooms feature a king-size bed, amazing views, and a decorative fireplace. Standard Hillside Room – Ideal for weekend stays, these rooms feature a king-size bed. Pool Bungalow – Just steps from the spring fed pools, this suite is made from stone from the surrounding desert. Casitas (Fall 2018) – Walking distance from the pool, the Casitas come with a golf cart and king or queen-size beds.